London: George G. Harrap & Co., Ltd, 1931. Softbound. VG- (Some wear to extremities of wraps; Light foxing throughout). Arthur Rackham. 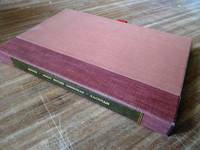 Slipcase covered in reddish-brown paper; Matching cloth at spine; Matching trifold portfolio within to hold book; Color illus. wraps; Illustrated endpapers; 35 pp. ; Profusely illustrated with 4 color plates and numerous bw figures. Clement C. Moore's classic story accompanied by wonderful, whimsical illustrations by artist Arthur Rackham.